I have to think her name other than Tanith. I've been thinking something like Cereza or such. She is my other charaters (L) step-sister and now she is taking message from their village to Aurora. Even though she is wolf and Aurora is bluefoxwolfdemon thing and why should she care? Well.. I was thinking that Aurora knows her family and where she comes from. And thins character herself is in nobody's side in this huge story. She is wanderer in the forest and like lone-wolf thingy. 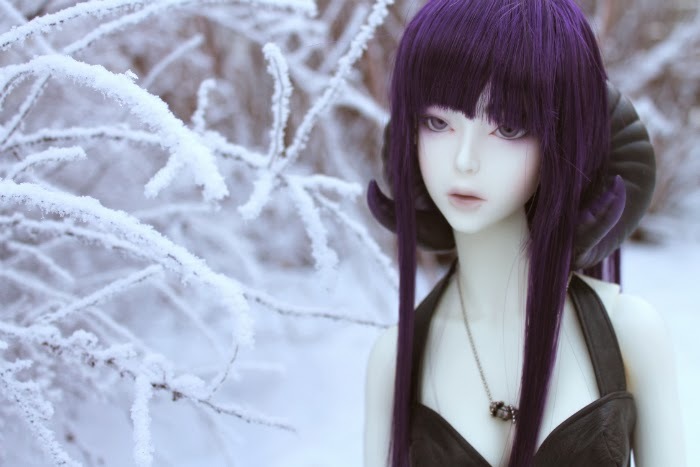 But it was so cold so I couldn't take very good photos of her.. :< And my fingers froze.. This one was from the inside. As you can see, it's so dark these days..